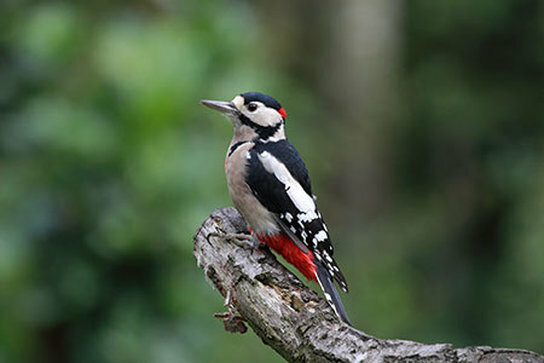 ​An east side plot holder has sited a woodpecker flying in and out of the central woodland. Others have heard the bird clattering on wood. While we can't be sure of the variety definitively, it's likely to be a Great Spotted Woodpecker which has been recorded as being seen regularly in Edinburgh. Blackbird-sized and patterned black-and-white, the male has bright red dashes on the back of its head and tail. Young birds also have a red crown. This bird has a unique bouncing flight, though spends most of its time clinging to tree trunks and branches. It feeds on insects, seeds and nuts. Very shy, it actively stays out of sight, though they will come to bird feeders in quiet situations. Its presence is often signified by a loud call or by its noisy spring ‘drumming’ in broad leaved woodland. You'll find a short audio clip of this drumming sound here on Great Spotted Woodpecker's RSPB page, along with video footage and further information.